Marc Goeglin moved into the role of director at the Early Childhood Alliance-Beacon Center in Indiana shortly after beginning National Early Care and Education Learning Collaborative (ECELC) training. His initial goal was to implement family style dining into the program, but he began to think of a fun and interactive way to introduce new foods to the children. Marc decided he wanted to build a garden, which would introduce children to fruits and vegetables and allow them to participate in growing them. Marc worked with home improvement store Lowes, who provided supplies and labor to build gardens in all of the Early Childhood Alliance programs. Together they designed a garden area that would be appropriate for all children in the program. In order to make the garden age-appropriate, they used fencing to block the area off but still allowed it to be accessible with or without assistance. Once the garden was complete, it flourished. Staff participated in taste-tests, art and science projects, and even developed a mini-farmers market. People from the local hospital would visit the center to purchase vegetables such as tomatoes, cucumbers, lettuce and squash. The money raised is used to supply the gardens with plants and seeds for the following year. With the new garden in place parent participation increased. One family brought in tomato seeds from their home country. In October 2014, Marc presented his garden project at a local conference, where it was a huge success. 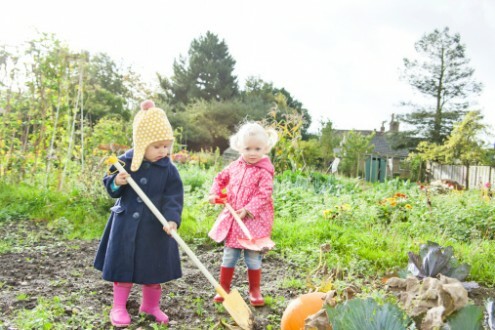 Children, staff, families and volunteers from the West Haven Child Development Center in Connecticut united as a team to implement an innovative preschool garden project. The children and teachers from each classroom rotated caring for their garden by watering and weeding each week. Sarah and her grandfather lovingly plant and tend vegetables and flowers. After helping Grandpa in the garden, Sarah and her grandparents enjoy a lunch made from home-grown vegetables.